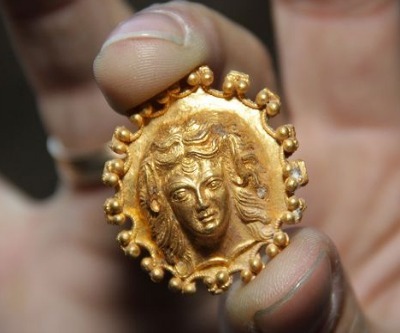 Bulgarian archaeologists have discovered bracelets with snake heads, a tiara with animal motifs and a horse-head piece in a hoard of ancient golden artefacts unearthed during excavations at a Thracian tomb in the north of country. The artefacts have been dated to the end of the fourth or the beginning of the third century BC. They were found in the biggest of 150 ancient tombs of the Getae people, a Thracian tribe that was in contact with the Hellenistic world. 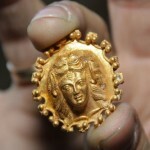 The hoard also yielded a golden ring, 44 female figure depictions and 100 golden buttons.